Whilst the rise in popularity of cryptocurrencies and blockchain technology may appear to be a very recent phenomenon, their origins go back decades. Prior to the 1970s, cryptography was primarily used for secret military or espionage purposes. However, over time and following various legal challenges, such secret information gradually crept into the public domain with open source encryption software code becoming more widely available. In the late 1980s/early 1990s, the “cypherpunk” movement was born in San Francisco with the primary objective of developing and exchanging ideas on privacy enhancing technology in an increasingly digital age (which is particularly prescient given current debates on such issues). Out of the cypherpunk movement and following several earlier attempts at creating digital money by members of the cypherpunk movement, bitcoin was born on 31 October 2008 with the publication of the bitcoin whitepaper by Satoshi Nakomoto (a probable pseudonym for a, as yet unidentified, developer or group of developers) and released as open source software code in 2009. Through the creation of bitcoin, which for the first time created a platform where trust is achieved through network consensus and verification (rather than being reliant on a third party) and money could be transferred digitally without being copied or “double spent”, Satoshi Nakamoto invented blockchain technology. Pandora’s box was quietly opened. It is not a coincidence that bitcoin’s genesis was in the midst of the 2007/2008 global financial crisis. With a perceived lack of faith in the existing banking sector, bitcoin created a new, immutable and completely decentralised peer-to-peer payment network that does not need banks, intermediaries or centralised infrastructure of any kind to work. Whilst central banks across the US and Europe embarked upon quantitative easing programmes, effectively printing money to alleviate the crisis, bitcoin was purposely designed as deflationary in nature with a fixed supply cap of 21 million bitcoins (as much as 4 million of which are widely believed to have been lost forever). This element of scarcity of supply, combined with the anti-fragile and immutable nature of the blockchain technology, has led many to believe that, in the long term, bitcoin may be superior to, and more robust than, traditional “fiat” currency as a unit of account, store of value and medium of exchange. As bitcoin is open source and, due to its decentralised nature, is not protected by any intellectual property rights, alternative cryptocurrencies (so called “alt-coins”), usually based upon a modification or “fork” of the original Satoshi blockchain, have flourished. Some have questioned whether this ability to create alt-coins dilutes the scarcity of supply of bitcoin. However, although certain currently popular alt-coins may have certain qualities or functions that, at the moment, bitcoin is perceived as lacking e.g. Litecoin (fast transaction speed), Ethereum (smart contracts, creation of new ICOs), Monero (privacy) and Ripple (use for bank to bank transactions), bitcoin remains at present the most secure, tested and truly decentralised network, with the most development being carried out on it. In addition, the network effect of bitcoin and the recent increase in interest from institutional investors means that bitcoin is likely to retain its market dominance in the space for some years to come. In 2017, there was also an enormous rise in, what are termed, initial coin offerings (‘ICOs’). An ICO is a fund raising exercise whereby crypto tokens on a blockchain (usually Ethereum) are issued to investors and then tradeable on cryptocurrency exchanges. There are two main types of tokens: i) utility tokens, which have a payment function and represent future access to a company’s goods and services (which may not yet be developed); and (ii) security tokens which provide its holder with a right derived from an underlying financial asset. Whilst security tokens are largely regulated by existing laws regulating securities, utility tokens are not, despite being acquired and traded mostly for purely speculative purposes rather than their future utility potential. This gap has been exploited by a large number of “pump and dump” style scams in recent times. Supposed utility tokens, with little or no future potential use case, have been pumped through online forums by its founders and insiders who then sell their tokens on the wave of an initial, short lived meteoric rise in price on cryptoexchanges, which then crashes never to return, leaving, in many cases, the second wave of investors holding virtually useless and worthless tokens. It is not dissimilar to the penny stock pump and dump schemes of the late 80s/early 90s as shown in the film The Wolf of Wall Street. There are also echoes of the late 90s dotcom bubble with projects having little or no utility potential being speculated upon just because it had a name associated with the tech boom – just substitute the word “dotcom” for “blockchain”. Historically, technology generally outpaces regulation. However, there will inevitably be a regulatory crackdown globally on such market manipulation through such schemes, which has already begun. However, although there are a large number of bad actors in the ICO space, as the market matures and regulation improves, genuinely useful, bone fide and successful projects are likely to emerge. In particular, the proliferation and adoption of asset-backed tokenisation may be a growth area in the future. Just as bitcoin has digitised cash, other asset classes may also be digitised by appending a highly divisible, digital representation of the relevant asset to the blockchain – eliminating much of the friction and third party costs associated with holding, storing and transacting such assets and increasing their liquidity. This could lead, for example, to the issuing of tokens that represent a company’s stock or real estate assets. Blockchain technology is evolving at a very fast rate and into many different, complex forms. However, one key distinction to grasp is the difference between a public and a private blockchain. The original bitcoin blockchain is a public blockchain. It is truly public and open ended in that anyone can participate without permission. It is decentralised and self-governed through network consensus and validation (most commonly proof of work consensus algorithms or “mining”). The transactions carried out on it are transparent and publicly accessible. It is also described as a “censorship resistant” blockchain. Conversely, a private blockchain (also sometimes referred to as a “permissioned” blockchain) is a closed system whereby permission is required for a person to participate. A person or group of persons control the network by writing and verifying each transaction. They usually do not involve any proof or work element. Many purists do not consider private blockchains to be true blockchains and consider them merely to be large databases that just use cryptography to secure them. However, they are generally faster and more efficient than a public blockchain and more suited to traditional companies and governments. One such government use of private blockchains is with land registries (as discussed below). Some countries such as Sweden and Georgia have already implemented blockchain technology with their land registries and Dubai has also announced its intention to similarly do so. 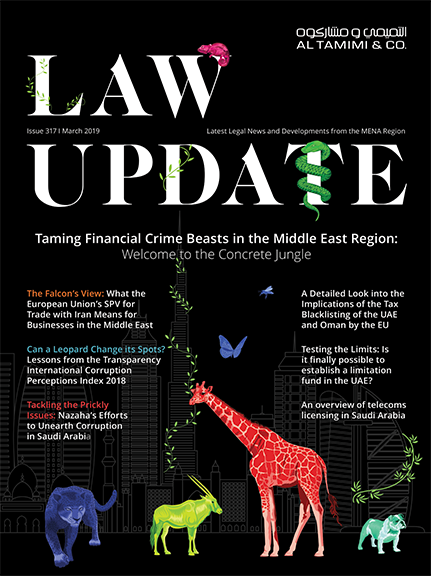 As with most jurisdictions across the world, the legal and regulatory framework in the UAE concerning cryptocurrency related matters is very much a work in progress and is a fluid and fast evolving area beyond the scope of this article. There have been recent media reports of some developers in Dubai offering off-plan apartments for sale in exchange for bitcoin or offering discounts if payment is made in cryptocurrency. This appears to be more of a marketing ploy by such developers. To offset the volatility risk, we would assume that such apartments have a set price in UAE dirhams for which an equivalent value in bitcoins (or a combination of cash and bitcoins) may be paid. It is likely that the developer would then immediately upon receipt of such bitcoins convert the value into fiat currency. Bitcoin is still very much at the early adopter stage of its development and mainstream use for transactional purposes has yet to materialise. The scalability of the blockchain has always been a problematic issue for widespread, high volume and fast transactional use (although this may be significantly improved through developments such as the “Lightning Network” or other “off chain” solutions layered on top of the bitcoin protocol and which are due to be rolled out very soon). Most cryptocurrency is held at the moment for purely speculative purposes, although such property deals may hold some attraction to long term holders of bitcoin who have amassed a large number of coins in the very early stages of its development when the price was very low and now wish to convert such coins into a more traditional asset class. Payment of the purchase price in cryptocurrency would not work in Dubai in the secondary sales market. The Dubai Land Department would not currently accept this as a method of payment in order to transfer property. The legality of such offers is also uncertain. Nevertheless, cryptocurrencies and blockchain have the potential to have a significant, disruptive effect on the real estate industry in the next 5 to 10 years. Most land registry systems across the world remain paper-based, although many countries are making the transition to recording the ownership of land online. The United Kingdom for example now stores all records online on the HM Land Registry database, but there are still vast amounts of paper such as original deeds and correspondence involved. This process involves all documents being manually checked before the information is uploaded to the database, resulting in some information being missed or incorrectly inputted resulting in a delay in the transaction being registered and visible online. The use of private, permissioned blockchains by land registries has the potential to reduce some of these difficulties. The benefit of a blockchain system is in creating a secure, immutable database that records the details of current and historic property ownership, dealings and encumbrances. The conveyancing process could also be significantly streamlined with the in-built trust mechanisms of blockchain and use of smart contracts removing the need for escrow arrangements and allowing for instantaneous and simultaneous processes relating to purchaser payment, title transfer and mortgage discharge. It also has the potential to significantly reduce the level of government costs and resources involved. The use of blockchain in land registries also has the potential to significantly reduce the scope for fraud as the information on a blockchain cannot be tampered with and its transparency means that all parties with permission to use the ledger can check the information in it. This could be particularly useful for countries in the developing world where the land registration system is not secure and is open to corruption and manipulation. However, although the relevant software may be available, it is only as good as the information that is inputted on to it and any such process needs to be very carefully managed. As part of this strategy, the Dubai Land Department (‘DLD’) is in the process of migrating its land records to a blockchain based system and developing systems to simplify the overall property transaction process. The idea of tokenisation is the process of converting rights to a real world asset into a digital token on a blockchain which can be traded like a cryptocurrency on a digital exchange. Real estate assets are, by their very nature, illiquid, non-fungible assets. Sale and purchase transactions take time to complete and there are a number of set processes that need to be carried out in order to complete the transaction by various third parties and intermediaries with associated transaction costs. Asset backed tokenisation has the potential to reduce these liquidity obstacles. Publicly listed Real Estate Investment Trusts (‘REITs’) already provide a degree of liquidity for real estate investors. However, with a token, it has been speculated that this liquidity could be even further increased with: even smaller financial barriers to entry with tokens that can be divided into much smaller units (such as bitcoin where each coin is subdivided into one hundred million, tradeable units called “satoshis”); the ability to tokenise an individual real estate asset (rather than having a basket of assets as with a REIT); and providing a cryptomarket place that is always open at any time of any day in any place in the world (traditional markets only trade during certain times on weekdays and are tied to a geographical location). Such liquidity has the potential to enhance the value of the underlying real estate asset by way of a liquidity premium as it mitigates the risk of not being able to sell the assets quickly if, for example, there was a sudden dip in the market. Fractional and proportional ownership is one of the more interesting potential applications for real estate. For example, token ownership of a multi-let commercial property could give the token holder fractional ownership of the property and a proportionate right to rental income and the proceeds of sale upon disposal. As blockchain also functions as a ledger, and through the use of smart contracts, the token itself could potentially also contain in-built title and other key information about the property and its performance or governance mechanisms with voting rights regarding the management of a particular building. If such tokenisation materialises as a widely adopted structure in the future, it is probably more suitable for commercial property and it is also likely that we would first see it developing alongside multi-layered, traditional ownership structures with fund or REIT ownership stakes being tokenised (rather than the direct ownership of the real estate asset with individual buildings going public). In addition, the legal and regulatory approach of governments and relevant authorities to any such new types of proposed ownership structures are likely to take a long time to evolve particularly in areas such as AML/KYC requirements, consumer protection, taxation and transfer fees and foreign ownership considerations. It is clear that a significant paradigm shift is underway with the proliferation of cryptocurrency and blockchain technology likely to have a transformative effect on a wide range of industries, such as real estate. Although the technology is advancing with breakneck speed, it will take time for legal and regulatory frameworks to develop and catch up. One difficulty is that cryptocurrency seems to be an entirely new, non-correlated form of asset class – whilst it simultaneously exhibits characteristics of currency, securities and commodities, placing it into just one of such categories creates challenges. The common perception of cryptocurrency as being used for illicit or nefarious purposes (such as with its early connections with the dark web and the Silk Road online platform) is looking increasingly outdated. There have been some clear signs of increased mainstream acceptance internationally such as: the Goldman Sachs backed start up, Circle, recently purchasing the US cryptocurrency exchange, Poloniex; bitcoin futures launching on the Chicago Mercantile Exchange; some largely positive messages coming out of the US from the relevant regulatory authorities (except in relation to utility token ICOs); government recognition of cryptocurrency as a means of payment in Japan; and, in the UAE, the DMCC freezone introducing the licensed activity of “proprietary trading in crypto-commodities”. Like it or not, its increased use and acceptance seems inevitable. However, the exact form and shape of how the space will develop remains a very open question. For further information, please contact Ian Arnott (i.arnott@tamimi.com).